At the beginning of a new year, you might be setting goals for 2019 and figuring out how you can follow through with them. Maybe you’re trying to stick to a healthy meal plan or earn a promotion at work. Without a comfortable, homey living space, you might lack the inspiration to follow through with these objectives. If you have curtains over the windows in your apartment, you should consider upgrading your space with this decorating hack. One simple way to make your living space appear more spacious is to install ceiling to floor curtains. These long curtains give the illusion of high ceilings, giving your apartment a grander, more luxurious feel. Whether you have stunning hardwood floors or unsightly, outdated tiles throughout your living space, you can get creative with carpeting to add some much-needed coziness to your home. While it used to be a popular trend to adorn apartments with small area rugs, this trend is losing steam, as people have begun to notice that small rugs make a room appear more compact than it really is. Instead, decorate your living room or bedroom with a large, neutral-toned rug. Before buying one, measure the space to make sure it will fit in its designated area. When you are on the market for a new coffee table, try out a glass table. These transparent furniture pieces take up much less visual space than wood or metal. However, remember to clean the tabletops on a regular basis, because a smudged, dirty glass surface won’t make for an appealing addition. If you’d like to implement an age-old piece of decorating advice, create an illusion that your living space is twice its size by placing mirrors strategically on your walls. In addition to making your apartment seem larger, mirrors reflect light. At this time of year, when the sun sets earlier and your apartment is dark by 5:00, make the most of the daylight by expanding your space’s natural lighting. One design that never goes out of style is neutral-toned furniture. Tan and white couches and armchairs give your living room a timeless feel. However, when you decorate with too much white, you run the risk of letting your apartment look like a doctor’s office. The best way to add some color to your living spaces is to use small accent pieces, such as pillows, throw blankets, vases or baskets filled with colorful shells, fruit, stones, greenery or other small, decorative items. Using small decorative items is also cost-effective; if you get sick of your accent color, you can switch them out for pieces of a different hue. It’s much cheaper than having to replace a couch that you bought in last season’s trendy tone! When you live in tight quarters, it can be easy to allow your items to pile up. Even if your apartment looks clean and fresh, there might be more hidden areas that need to be de-cluttered, such as your closets, drawers and bathroom shelves. Create a donation pile for clothing you haven’t worn in a long time, books you don’t plan on reading and other items that aren’t imperative to your everyday life. Getting rid of your fourth set of measuring cups, a pair of jeans that haven’t fit you since college or year-old magazines that are quite literally gathering dust will help you feel refreshed and organized in the new year. Nice kitchen tables can be expensive. If yours is starting to look a little worse for wear, you might be on the market for a replacement. Instead of spending hundreds of dollars on a new table, try revamping your present table with a trendy table runner. These long strips of fabric add some style and fun to tables of all shapes, from round to square to rectangular. Unlike a tablecloth, which covers the entire surface of the table, a table runner creates a modern, interesting feel to any dull table. If your apartment is looking a little dull, try to liven up the place with different types of plants. You might want to purchase a fern, small fig tree or spider plant to place in its pot on the floor. If you like the aesthetic of a plant but don’t want to take on the responsibility of nurturing it, try out a low-maintenance house plant, like a cactus or succulent, that only needs to be watered sparingly. If you want to incorporate vibrant color and life that a simple house plant cannot, buy an elegant bouquet of flowers to place on your kitchen counter or coffee table. In addition to looking incredible, these blooms will make your living room smell great. 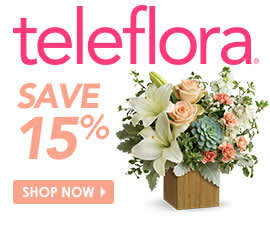 Shop Teleflora’s extensive collections of flowers to find the right bouquet for your apartment. It’s a new year and time to find the whole new you! Share below what ways you are going to make your house or apartment fit your personality better this year!